Have you ever had the terrible experience that you have to rack your brain when you want to find out where your door key or phone or some certain important thing is? This is quite a common phenomenon and we call it amnesia. Are you an amnesiac? Actually nowadays due to heavy pressures from life and work everyone has the amnesia symptom, no matter light or heavy. Then suppose that you’ve got collections of BD/DVD movies at hand, and you are some kind of forgetful, what a difficulty to find them? The best way to keep your favorite BD/DVD movies into your mind is to backup them to your PC because I don’t think you are so forgetful that you can’t remember where your PC is. This will be a big joke! Then how to backup your BD/DVD movies to PC in the common format of H.264 MP4? Well, it’s no big deal with the help of Pavtube BDMagic. Patuve BDMagic, as its name suggests, is capable to backup, rip and convert BD/DVD sources to any possible audio and video format with high quality for playing videos on different popular devices. Really deserves the title of “Magician”! How to Backup DVDs/BDs to H.264 MP4 On PC With Pavtube BDMagic? After purchasing the best Blu-ray/DVD to MP4 Converter for Windows (free trial is also supported), install it on your PC, run it and import your DVD/BD movies by clicking “File” ＞ “Load from disc”. In addition to discs, you are also allowed to load DVD/BD folders, BD ISO Image files and DVD ISO Image/IFO files. On this main interface, you can freely choose the video title you want to rip and convert. Batch conversion is also supported. Click the format bar to choose “HD video” ＞ “H.264 HD video (*.mp4)” as your target output video format. 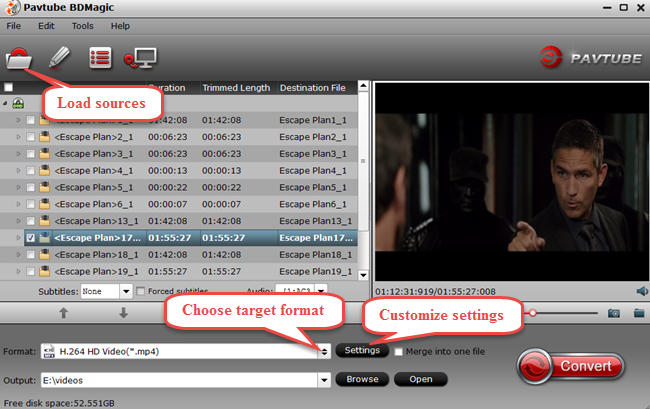 You can also take a try of converting your movies to other video formats or just audio formats for listening enjoyment. 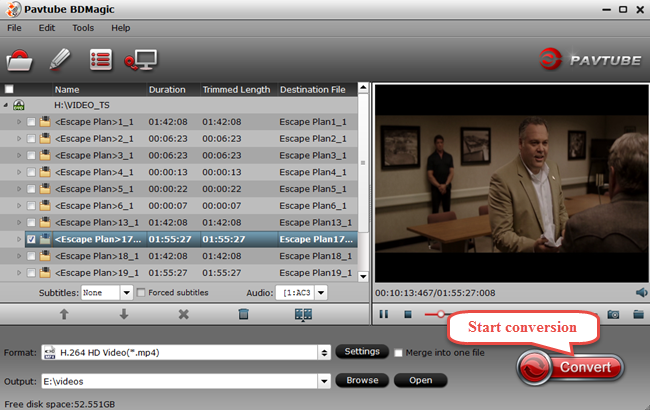 Wanna make yourself a personal and unique video, go to the video editing interface by clicking “Edit”. 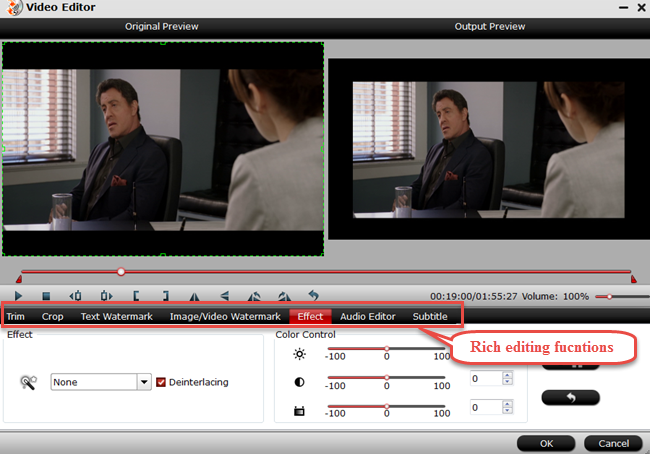 Have a try of those paralleled video editing buttons that enable you to cut or beautify your movies through trimming, cropping, adding text/image/video watermark, adjusting your image effect, etc. Hope you have fun making your own videos! After everything is set down for video conversion, choose your video output file and click the big red button “Convert” to convert your disc to H.264 MP4. If you’re tired of waiting the whole converting process, tick off “shutdown computer after conversion” and take care of other business or entertainment. Keep your discs in some fixed places where you’re easy to find them, or try the above backup tool – Pavtube BDMagic to convert your movies to some certain format and store them on your PC. Sure the latter is the best solution and also your top choice. Wanna get more with less money? Try the bundle of Pavtube BDMagic and Pavtube DVD Creator, and it only costs you $49.9. What a big sales promotion? Expecting more surprises? Go to www.multipelife.com/special-offer for more bundle information. not that much of a internet reader to be honest but your blogs really nice, keep it up! I’ll go ahead and bookmark your website to come back in the future. Love that its self explanatory! You cant go wrong with this software! Keep up the nice work. I read a lot of interesting content here. Thanks! Wow, it’s no surprise why you’ve so many people following you online. great solution! Thanks for magnificent information I was looking for this info for. I need backup all bluray to my computer, thanks.